AllWork’s technology helps companies shift to a more flexible and efficient on-demand workforce management model. 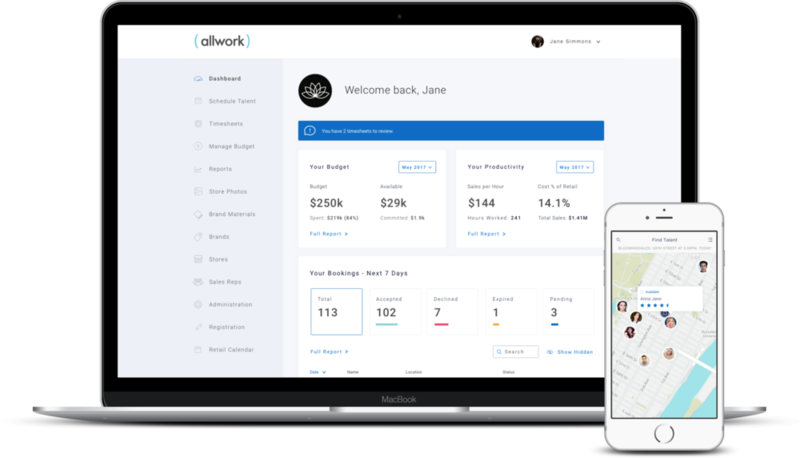 AllWork’s mission is to help companies transform their hourly workforces into a more efficient and flexible on-demand labor model and provide workers with the ability to take control of their schedules, access new opportunities and maximize their income potential. Our platform has been built specifically to help companies shift to an on-demand workforce while automating tasks and seamlessly connecting employers to talent. We provide a complete outsourced solution that includes scheduling, budgeting, field management, payments and benefit administration. AllWork helps companies efficiently manage and pay talent in all 50 states and Canada. Our all-in-one solution is specifically designed for optimizing hourly talent management resulting in a reduction of administrative and operational costs. Our platform provides talent with top job opportunities as well as the payments and administration functions. We create cloud-based talent communities who benefit from career development content, community interactions, and social connections built around their relevant industry. The AllWork app gives managers the ability to improve coverage and quickly make last minute scheduling adjustments for their hourly talent. If someone calls out at the last minute? No problem, Simply post an open shift request and have talent working in no time. Our app gives managers full transparency on talent performance including sales numbers, photos, notes and more. When the talent arrives for their shift, they clock in and AllWork's system will use GPS verification to confirm that the talent is at the correct location. Start managing your workforce better.